For many families, the kitchen is the heart of the home. It’s where kids gather for after-school snacks and where guests linger over cocktails. A well-designed kitchen should reflect the décor scheme of the rest of the home, but also present its own unique personality. As a centerpiece that naturally draws the eye, the kitchen’s countertops are a crucial design decision. When you decide to make The Town of Whitehall your new home, you’ll have your choice of granite or quartz countertops. 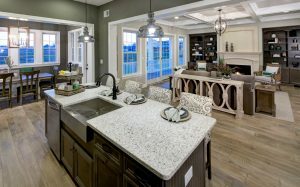 Schedule a tour today of the model homes at The Town of Whitehall—a masterfully planned Montchanin Builders community in Delaware. And when it’s time to choose between quartz and granite, consider the following factors. Granite and quartz are both natural materials, with a slight difference. If you prefer 100% natural countertops, you should choose granite. Granite countertops are carved out of quarries around the world. They’re highly polished and cut to size, but the appearance is left untouched. If you don’t mind having mostly natural countertops, you could choose quartz, which is an engineered stone. About 93% of a quartz countertop is the natural stone, with the remaining 7% comprised of polymer resins and color pigments. Both granite and quartz countertops are attractive choices for every kitchen, but there are some notable differences. Homeowners who choose granite do so because they enjoy the one-of-a-kind look. Since granite isn’t modified, its dramatic swirls and patterns are undeniably unique and downright gorgeous. The showy nature of granite will make any kitchen pop, and homeowners can choose from light to dark granite slabs, some of which have beautiful flecks of blue, red, or gray. As lovely as granite countertops are, homeowners who love clean lines and homogeneity are more likely to choose quartz countertops. Quartz tends to work best in kitchens that emphasize clean, modern lines and orderly simplicity. If the swirls, spots, and specks of granite look too “busy” in a kitchen, then quartz is a perfect alternative. Both granite and quartz countertops are highly durable, which is one reason why they’re so popular. Granite is more brittle than quartz, although its brittleness is usually only problematic during the installation process. Once the granite is safely installed, homeowners have nothing to worry about. The maintenance of a countertop is an important consideration. Both granite and quartz countertops are easy to care for, although granite does require a little more upkeep. Granite is more porous than quartz, which means that spills must be wiped up promptly to prevent staining. Granite countertops should also be resealed every two to five years. Quartz is low-maintenance. Since it is nonporous, it resists staining well. However, it’s best to use cleaning products recommended by the manufacturer, as quartz reacts poorly with certain chemicals. The beautiful, spacious homes at The Town of Whitehall were conceptualized by design experts and built by master craftsmen. The Town of Whitehall embodies an “old town” ambience, bringing together the spirit of true community with easy access to modern amenities. Call Montchanin Builders in Wilmington, Delaware today to speak with a friendly staff member about our quick and easy pre-approval process.